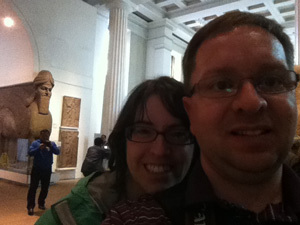 Some of the most amazing things I saw during our recent trip to London (read Part 1 here) were in the British Museum. 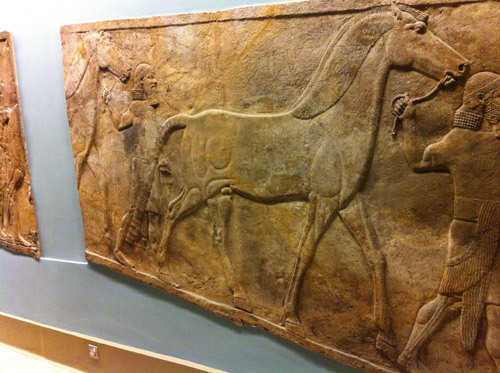 Today, I’d like to share photos with you from their Assyrian exhibit. The Jews were in the middle of the greatest revival since King Solomon. They had torn down their idols, kept the Passover, cleansed themselves, and re-instituted temple worship to God. 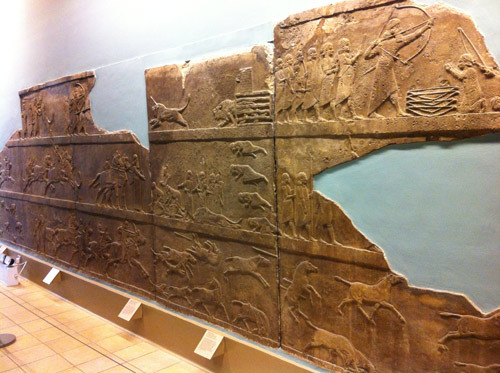 The Assyrians laid seige against Lachish first, which was a city between them and Jerusalem. Then they also came against Jerusalem itself. They made many boasts about how they were going to conquer Jerusalem. King Hezekiah and the Jewish people were afraid, and they sought the Lord in prayer. They also asked the prophet Isaiah to intercede for the nation. Then God answered their prayers. He reassured them that the Assyrians would not be able to take Jerusalem, and that God Himself would conquer the Assyrians. That night, one of God’s angels went out to the Assyrian camp all around Jerusalem and killed all their mighty men of valor, all their captains and leaders–185,000 of them. The Assyrian king, Sennacherib, then turned tail and ran back to his own country. He went back to the temple of his pagan god, where two of his sons killed him with the sword, and a third son then began to reign in his place. Bad move, Sennacherib. Stay away from Jerusalem. Jerusalem belongs to God, and He will fight for what is His. 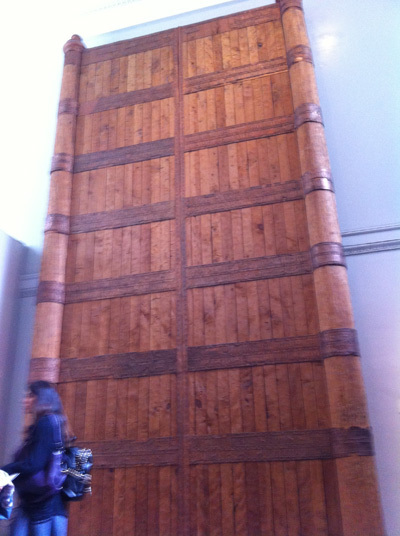 Well, I had no idea what we would find at the British Museum, but guess what? 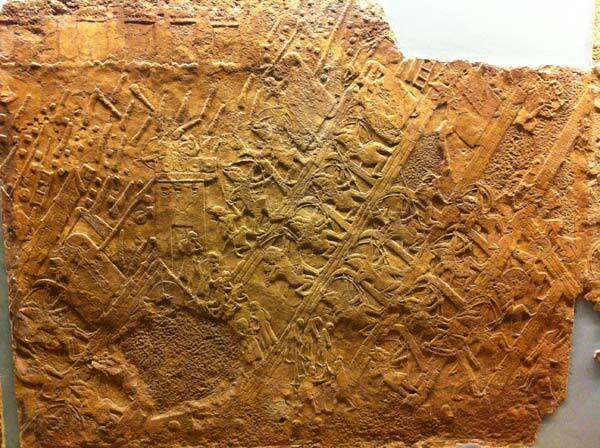 They have a huge exhibit dedicated to the Assyrians! Those very same Assyrians that God conquered! First, the Jewish people were not afraid for no reason. It wasn’t like the Assyrians were a bunch of rabble in tents that just decided to hang out in front of Jerusalem one day. No, the Assyrians were in charge of an EMPIRE. They were a huge, mean, fighting machine. They had sophisticated weapons (for the time), fortified cities, and palaces. These guys were BAD TO THE BONE. To give you one example, here is a photo of the city gate to one of their cities. The wood is not original, of course, but the metal is the actual metal that held the gate together, fitted to the same size it was originally. It’s inscribed with pictures and tales of their military victories. See the person in the photo for scale? Yeah. Pretty imposing. (Please forgive the blurry photos sometimes; it was quite dark in the museum in some places, and photography was difficult.) If I were to approach a city with a gate like that, I think I would be a little intimidated. Like I said… these guys were bad to the bone. Another section of the panels from the Lachish Relief shows the Jewish prisoners being flayed alive, skulls stacked up, etc. Ugh. These guys were mean, to say the least. The knives are rather corroded, of course, but you can still tell they are knives. And how would you like to get hit with one of those slingstones? 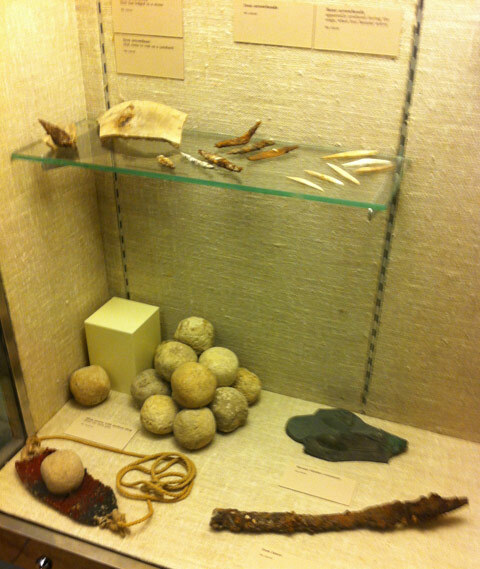 I think the artifacts in this photo were Jewish weapons, by the way. Then the section below is just one small part of a display that must have totaled a couple hundred linear feet of bas-relief walls. 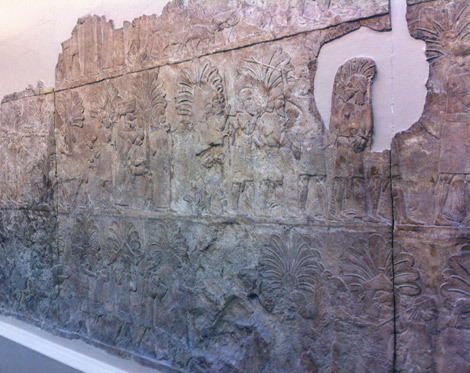 These are stone walls from the Assyrian palace. Pretty amazing, huh? So now you can see why I said that King Hezekiah and the Jewish people weren’t afraid for no reason. These guys were BAD and they were coming to steal, kill, and destroy… just when they were in the middle of the greatest revival since the days of Solomon. God is bigger than the Assyrians were, and God is bigger than your modern-day Assyrians too. When God’s people prayed, God sent His angel to fight their battles for them. ONE angel killed 185,000 enemy troops in one night. That blows me away. And what blows me away even more is that God is still fighting on behalf of His people. What army is coming against you today? No matter how big the war machine is that’s coming against your life, God is bigger. He’s bigger than weapons of war. He’s bigger than huge city gates. He’s bigger than the biggest military machine in existence. If you’ll ask Him, He will fight your battles for you too. 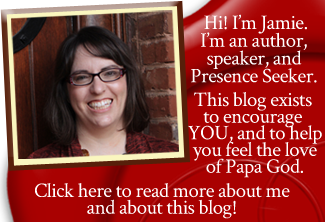 What do you need God’s help with today? Ask Him for help with whatever you need, and watch Him win the victory!